mustard Archives - What the Forks for Dinner? Salmon Cakes or better know in some circles as Salmon Patties, were a staple dinner when we were kids. You remember, the canned salmon that you had to pick through to try and get rid of the bones and cartilage that was in with the salmon. 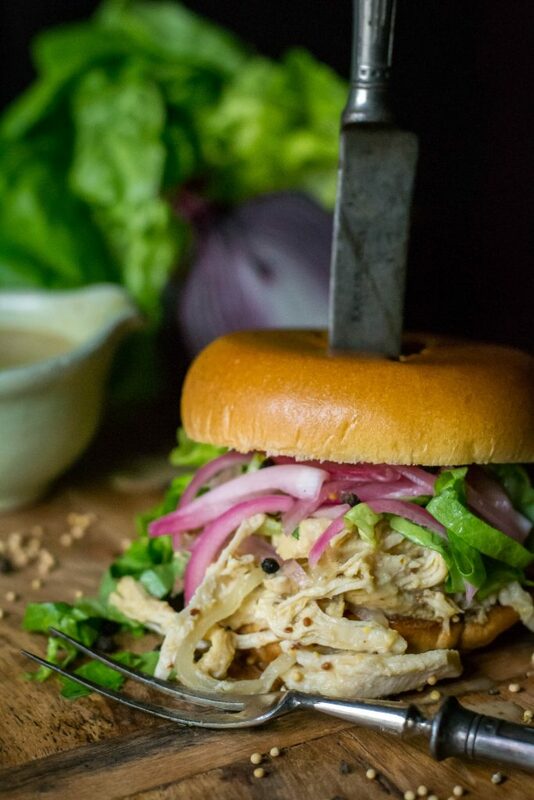 I always though it was gross, but truth be told I was never a big salmon patty lover as a kid. Turns out the bones and cartilage are edible and full of calcium……who knew? That still as a kid, would not have swayed me. I ate them, because anyone of a certain age knows, you ate what was in front of you or you went hungry. Beside they weren’t awful just not my fav. So, fast forward a few years….ok maybe more than a few, but I learned the love of real, honest to goodness salmon. Not from a can, but from the sea……such a big difference. If possible buy wild caught salmon, fresh is best. Now, when I say fresh, I mean wild caught, not fresh in the meat case at the grocery store. Actually, don’t assume that fresh is always better than frozen fish. Sometimes frozen is better than fresh. Plenty of frozen fish is put on ice on boats right after it’s caught to preserve its freshness. I buy frozen frequently. It’s easy to like salmon, its tender, mild-tasting, and versatile. It’s even easy to cook—the fatty texture helps keep the fish tender and moist, so the perfect choice for Salmon Cakes. Plus its loaded with those all important Omega’s. Using fresh salmon for these Salmon Cakes keeps them moist, as using canned can result in dry cakes. Some Miracle Whip, and as I always say…..mayo if you must…….I prefer Miracle Whip, grainy mustard, capers, dill, and green onions, plus panko crumbs ( I love these ) bind the fresh salmon together. I used my 1/3 cup measure as a measure and a form. The mixture pressed into the 1/3 cup measure makes the perfect cake. A quick visit to the frying pan to brown them, and then into the oven to finish.The oven time is the perfect time to make the sauce. 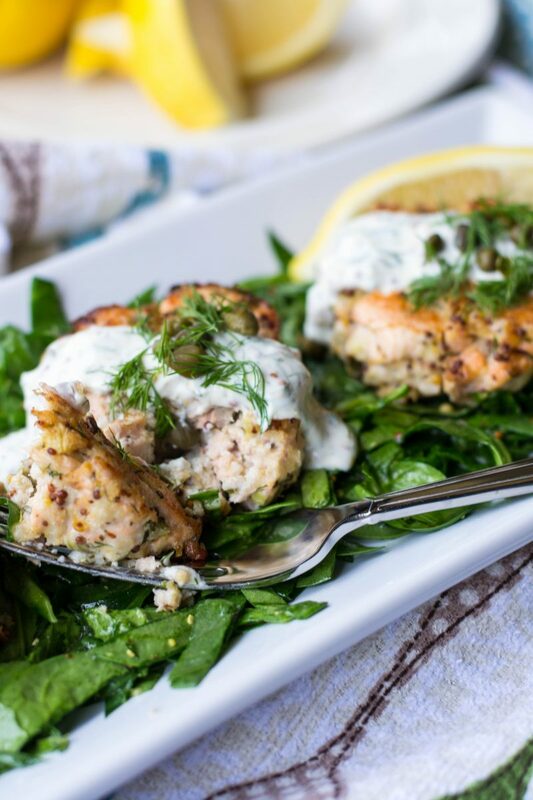 Greek yogurt, lemon, juice, dill, green onion, and mustard make a beautiful sauce to slather over the Salmon cakes. Creamy, lemony, dilly = yummy! 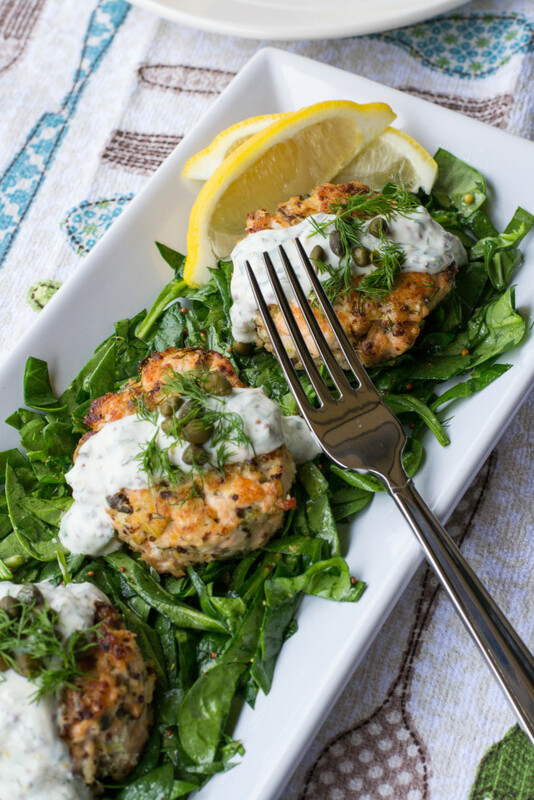 The salmon cakes need a bed to lay on and what better than spinach? Just a olive oil, lemon juice, mustard vinaigrette, tossed with the spinach make a pretty little bed for the Salmon Cakes. To serve, place the dressing spinach on a plate or serving platter, depending if you are serving individual or family style. 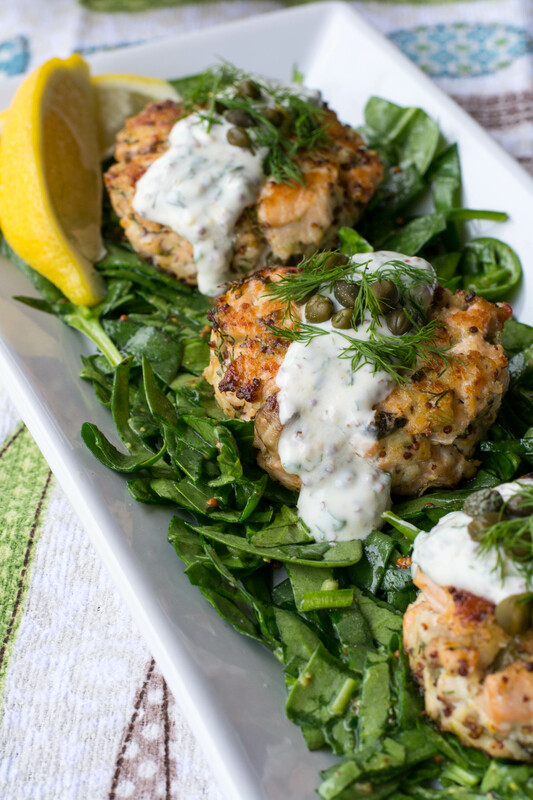 Then place the salmon cakes on the bed of spinach. Top each cake with the yogurt sauce, and garnish with extra dill and capers if you wish. Cut salmon into small dice pieces and place in a large bowl. Stir in panko crumbs, 2 tablespoons mustard, Miracle Whip, 1 tablespoon dill, white part of green onions, and capers. Mix until well combined. Using a 1/3 cup measure scoop patties onto a baking sheet lined with parchment paper. 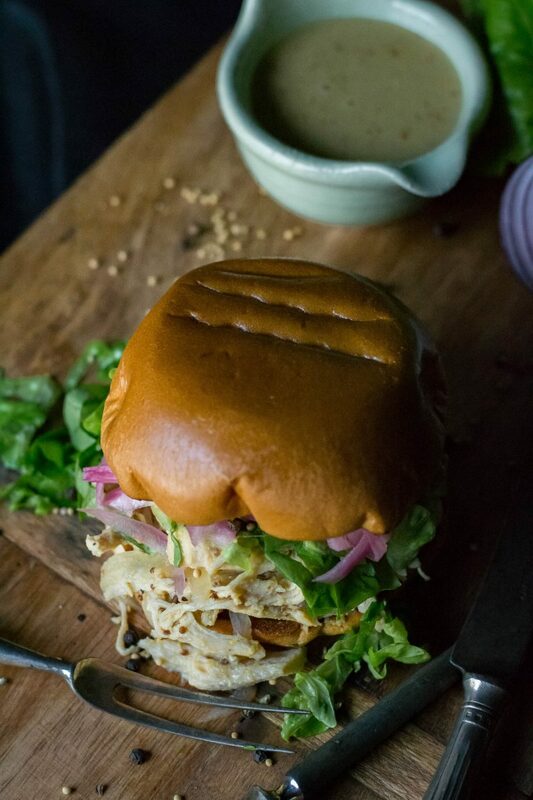 The measuring cup forms a nice patty. You should have 8 patties. Place in refrigerator for 5-10 minutes. Over medium high heat, heat 1 tablespoon oil: cook patties until golden brown. Transfer patties to a clean baking sheet lined with parchment and place in preheated oven for 10-12 minutes or until cooked through.. 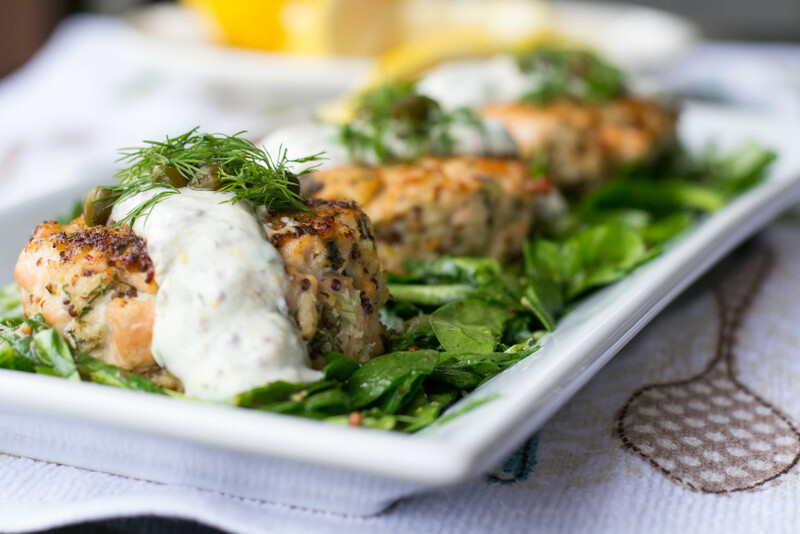 While patties are in the oven, in a small bowl combine yogurt, 1 tablespoon lemon juice, 1 1/2 teaspoons mustard, 1/2 tablespoon dill, and green part of green onion. Season with salt and pepper and set aside. In a small bowl place 1 tablespoon oil, 1 tablespoon lemon juice, and remain 1/2 teaspoon mustard, whisk to combine well. Chopped spinach into slivers and place in a large bowl, toss with oil, lemon juice mustard mixture. 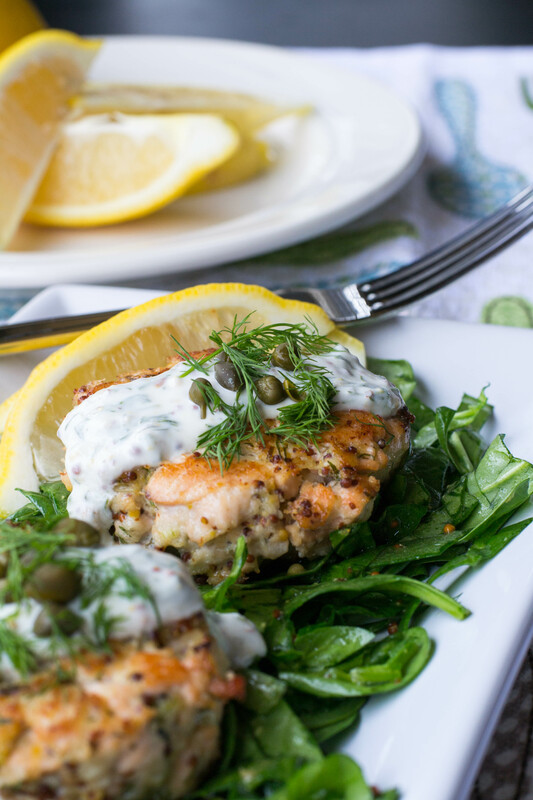 To serve place a bed of spinach and two patties on each plate, top with yogurt sauce, and garnish with capers and dill if desired. Serve with extra lemon wedges. 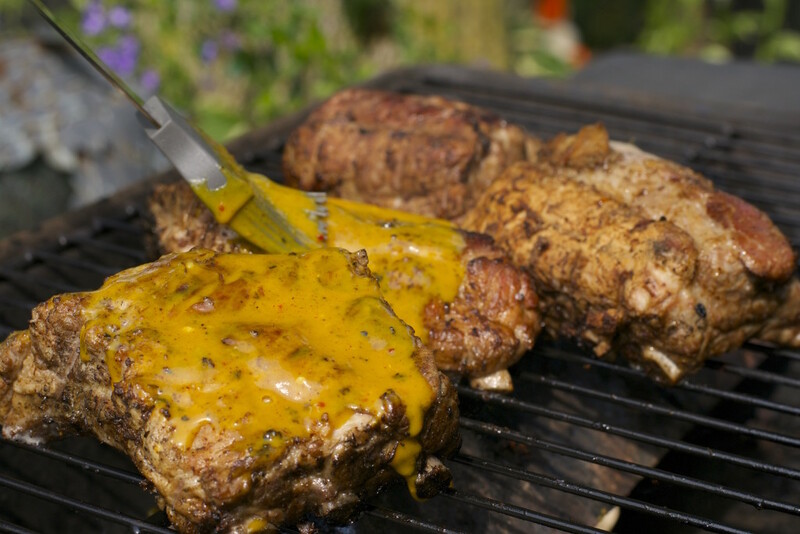 Nothing says summer like a BBQ Cookout, and nothing is better than finger-licking, lip smacking ribs! 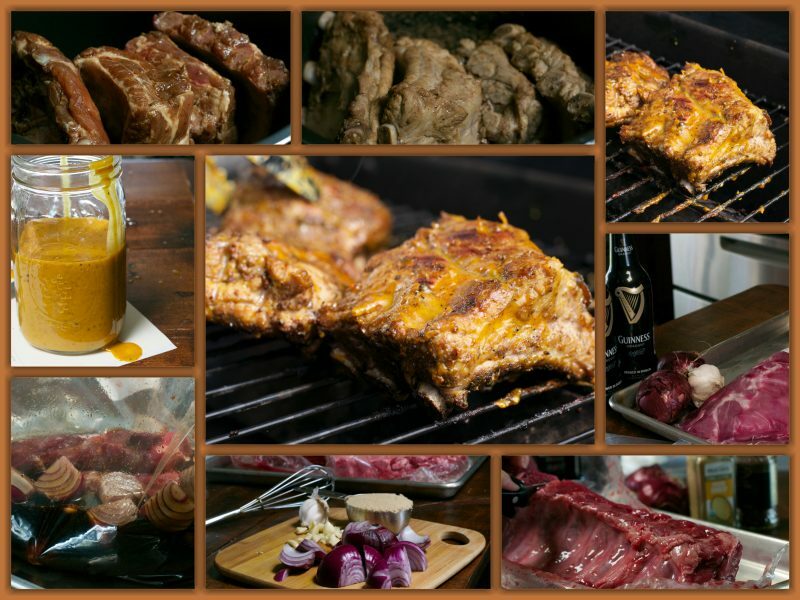 Guinness Ribs with Carolina Sauce!